It responds to the warm caress of sunlight, to the flickering flames of a log fire, or simply to electric light. It changes colour over time and every day. 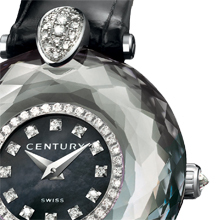 A chameleon material with unique properties, CENTURY alexandrite is the new star in the MOGUL line, where it joins other iconic timepieces designed by CENTURY. “Beyond Imagination” is the CENTURY motto. It could also be the maxim of CENTURY alexandrite, a material with a magical aura and an ever-changing colour. In daylight it has a blue-green tone, between lagoon blue and mint liqueur, while in artificial light it acquires an amethyst hue with the natural elegance of a woman who changes her outfit in the middle of the day. In search of a new mode of poetic expression that has both feminine and eternal qualities, the master craftsmen at the CENTURY workshops have long dreamt of this gem whose mystery, transparency and beauty evoke the magic of precious stones. But also the magic of a new material, to which CENTURY has naturally dedicated the best jewellery expertise. This meticulous craftsmanship has allowed CENTURY to celebrate each of the chromatic variations expressed by CENTURY alexandrite. A legend in the making, this timepiece sparkles like a precious stone thanks to its rose cut and its 192 facets, each one worked individually by hand. Light penetrates the watch case, then rebounds infinitely along the facets of this jewelled treasure, like a firework display that changes colour as the hours go by. 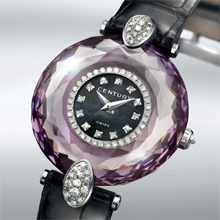 A rare timepiece, the MOGUL ALEXANDRITE has been entirely conceived as a piece of fine jewellery. Available in a red gold or white gold version, its dial is set with 48 diamonds, while the lugs that attach it to the alligator strap have been designed like the claws that enclose a precious stone, and are resplendent with 45 pavé-set diamonds. Each stone adds to the mythology of feminine luxury, which fuses the wonders of the natural world with the incredible feats achieved by the hand of man. This spectacular and evocative combination will delight women who know how to look beyond the best to find the truly exceptional, for whom time is synonymous with beauty and uniqueness.